Royal Dutch Shell widened its lead over Exxon Mobil as king of cash among the world’s top oil and gas companies last year but its US rival could catch up with its investment drive in new production. The five leading firms, known as oil majors, more than tripled profits and doubled cash generation since 2016 as deep cost cutting bore fruit after an industry slump. Unlike previous cycles, most executives have promised in the past week to stay thrifty, with memories of the 2016 oil price plunge below $30 a barrel still fresh and the outlook remaining foggy. For investors, it’s been a bumpy ride. In the past five years, oil majors broadly underperformed global stock markets. A sharp drop in crude prices in the last quarter of 2018 to below $50 a barrel from a four-year high of $86 a barrel in October was a bleak reminder of the uncertainty. But stronger than expected results in the fourth quarter of 2018 reported over the past week gave the sector a boost as companies surprised investors with their resilience to generate profit, or breakeven, at oil prices around $50 a barrel. A barrel of benchmark Brent is now trading around $60. [O/R] “The cyclical driver is higher oil prices and strong refining margins but underlying this is a structural move to lower breakevens which is driving higher cash flows,” said Rohan Murphy, energy equity analyst at Allianz Global Investors. “I think the companies will remain disciplined,” he said. “When I meet the managements of these companies they are enthused about the future rather than feeling constrained.” After Exxon and Shell, the other three majors are US firm Chevron, Britain’s BP and France’s Total. 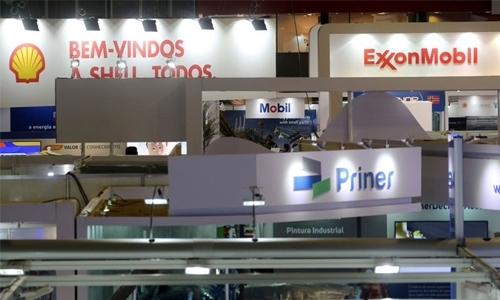 Exxon is the outlier of the group for now, as it boosts its spending to develop large-scale projects in Guyana and Mozambique and its sprawling US onshore shale portfolio. The company, still the biggest energy firm in terms of production and market size, was slow to respond to the drop in crude prices, lagging rivals when they slashed costs, sacked employees and sold assets in the past three years. But under Chief Executive Darren Woods, who succeeded Rex Tillerson when he became US secretary of state from 2017 until last year, Exxon is undergoing profound changes in its operations and structure in an effort to catch up. Exxon will increase capital spending to $30 billion this year from $26 billion in 2018. It is also trying to sell large assets in Azerbaijan and Tanzania. Woods told analysts in a fourth quarter earnings call that the Irving, Texas-based company would accelerate divestments. “Exxon Mobil has pulled the divestiture value creation lever much less than peers over five and 10 years,” said Doug Terreson, analyst at Evercore ISI. “It is timely for them to divest and use proceeds to reinvest in higher quality areas.” Exxon has pledged to double earnings and cash flow from operations by 2025. Anglo-Dutch Shell is still set to retain the crown for cash generation until the end of the decade thanks to rising production and its dominance in liquefied natural gas (LNG). But Exxon’s new production should sharply narrow the gap, according to estimates by HSBC, which has a ‘hold’ rating on Shell and ‘buy’ on Exxon. While Exxon invests heavily into future production, Shell’s output growth is set to slow after years of gains following the acquisition of rival BG Group in 2016. For Shell and other rivals which have held back on new investments, the race to find new reserves to replace depleting fields will be a key challenge, said Darren Sissons, portfolio manager at Canadian investment management firm Campbell, Lee & Ross.